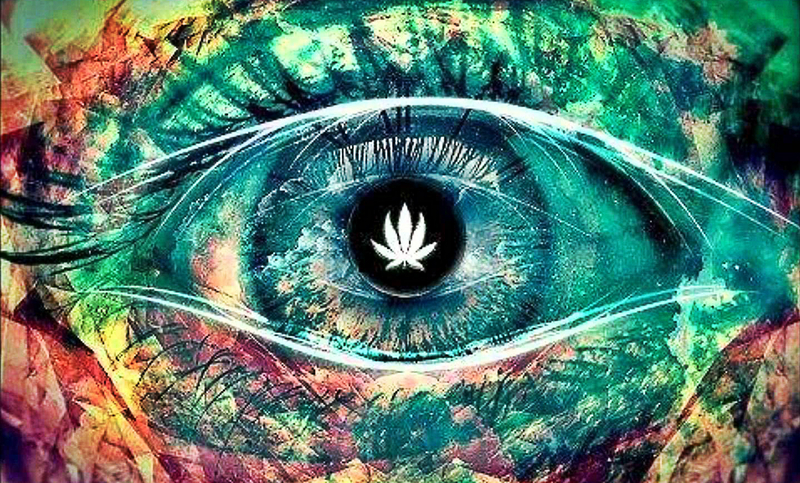 It is a well-known fact that the pineal gland responds to psychoactive drugs, but what really happens to the 3rd eye when we use cannabis? 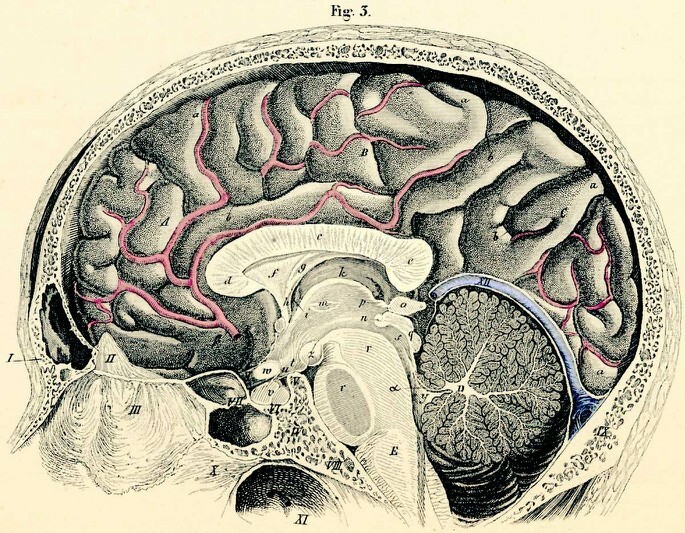 The Pineal Gland or the ‘Seat of the Soul’ as described by Rene Descartes, is the focal point of our spiritual guiding system which makes us go beyond the five senses of rationality and become multisensory, tuned into and aware of higher dimensions of consciousness within a holographic cosmos. This gland located in the centre of the brain, it is about a quarter of an inch in size, reddish-gray, and weighs about one-tenth of a gram. Unlike other parts of the brain which come in pairs, the pineal gland is singular (possibly symbolizing unity). Its location in the center of the brain and presence in other species indicates it is an older part of humanity’s evolutionary brain system. The pineal gland is said to have the ability to access great spiritual power, intellect, and insight. Many believe it is the third eye so often described in the myth and lore of eastern religion. Once it is activated it is believed that gives supernatural abilities and spiritual powers. The gland is the topic of much debate, and much has been written on it in recent times. Many say that fluoride is one of the main things that blocks the pineal gland by decalcifying it – others say it is a combination of things. What this means is that the universal allegory of seeing a white light in near death experiences, or having profound spiritual visions that affect our basic nature, are senses received through this gland. This could also be the area where images in our subconscious are rearranged into new and strange imagery during our dream states. The visual receptors there operate in pure darkness, but receive peripheral stimulus from the brain. The gland secretes a body-produced DMT molecule in situations of near-death. The correlations between this concept and that of sensory deprivation while using psychedelics, especially in the manner of dark, saline-filled “float chambers” is suddenly not as far fetched as they once seemed. It is forcing the mind to connect with the conditions found within the pineal gland, bringing insight to the surface. 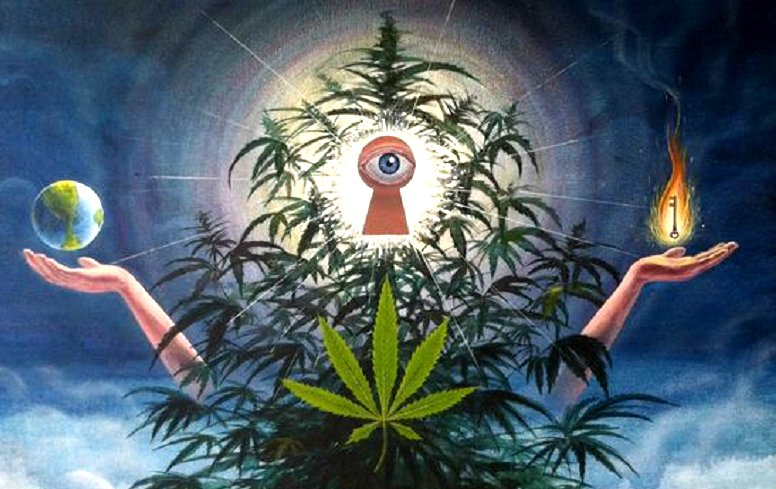 HOW DOES CANNABIS WORK IN THE PINEAL GLAND? Research on rats has shown that the pineal gland contains a functional endocannabinoid system, in that cannabinoid receptors type 1 and 2, and the endogenous ligands that bind to them, anandamide and 2-AG, are all present. The study showed that the activity of the CB?-receptors varied according to a daily cycle, with lowest activity levels occurring at the end of the daylight period. It also showed that levels of an enzyme responsible for synthesizing new endocannabinoid molecules, NAPE-PLD, was reduced during the middle of the dark period. It is likely that THC’s endogenous analogue anandamide performs the same action of reducing the norepinephrine-induced release of melatonin, and is therefore fundamentally involved in pineal gland function. It seems that low levels of anandamide or THC are therefore needed in order for melatonin production to increase. As melatonin levels increase, as they should normally do at the end of the daylight period, feelings of sleepiness should occur. While we are far from having a complete understanding of the complex network of chemical compounds that interact in the brain, we are beginning to build a simple map of how all these interrelated processes fit together. 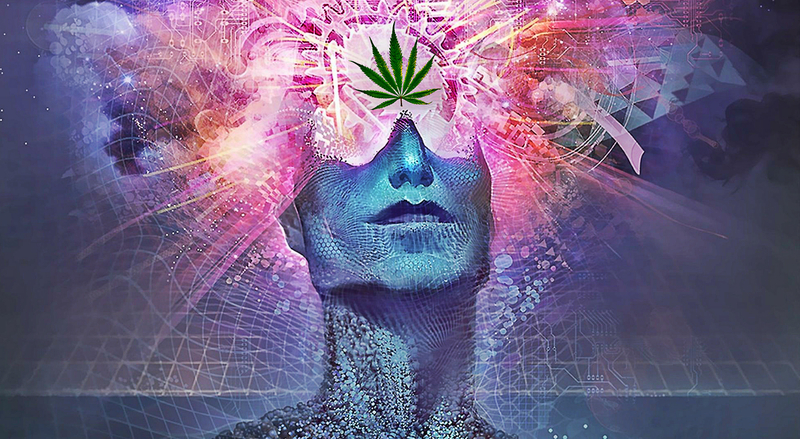 It is increasingly clear that the endocannabinoid system is a fundamentally important messaging system that helps to link together various parts of the brain, many of which work together to give us the subjective experience of being “high”. The pineal gland itself is crucial to this process, and has undeniable importance as a source of consciousness-altering compounds. It works with the endocannabinoid system and various other regulatory systems to control our subjective daily experience of mood, wakefulness and sleepiness. When we introduce external psychoactive compounds, this process can be altered in fundamental ways, some of which can be greatly enjoyable to the individual! But most importantly, they stimulate the pineal gland. The pineal gland is just one tiny link in an extremely long and complicated chain, which stretches between some of the most basic and fundamental parts of the brain and some of the most advanced, such as the neocortex, which only exists in mammals. However, the pineal gland has repeatedly been associated with the biosynthesis of important natural compounds related to sleeping, dreaming, and dream imagery. The presence of these compounds in the pineal gland is one of the most important reasons that so many view it as the “seat of the soul”, or a key to “spiritual enlightenment”. Without a doubt, the most famous of these compounds is N,N-Dimethyltryptamine, more commonly known as DMT. It’s actually somewhat controversial as to whether or not the pineal gland is responsible for synthesizing DMT in humans, but there is significant evidence to suggest that it is the case. DMT and related compounds tryptamine and bufotenin have been found in human urine, and DMT itself has been shown to be synthesized in the pineal gland of the rat brain. A closely related compound, 5-MeO-DMT has been found to be synthesized in the human pineal gland, but thus far, it has not been proven that DMT itself is too. Light, the eyes and the ‘third eye’ or pineal gland form a triad which directly controls and regulates normal or altered consciousness and many bodily functions? these three factors are also directly related to, or implicated in, mystical states and the ‘psychedelic’ experience. The pineal gland first becomes visible in the human fetus at the same time as does the clear differentiation of the fetus into female or male gender. The time for both of these events is 49 days, the period of time that, according to several Buddhist texts, the life force of a deceased individual coalesces around its next corporeal existence. If the life force does indeed enter through the pineal, the manifestation of this coming and going would be the release of psychedelic tryptamines, which would mediate the visionary experiences associated with near-death, and near-birth states. Another potential reference to this curious little gland may occur at the end of the New Testament book of Revelation, where we find that the elect will know God intimately, “his name will be in their foreheads,” which is where the pineal deeply lies. Similar imagery occurs in the Persian tradition of the light-like sacred fluid, the “vivifying and spermatic” xvarenah. Perhaps if enough modern psychonauts achieve the pineal experience we can push this new frame of mind onto the rest of ego-bound humanity.